If you’re not content with your crooked teeth and looking for a viable dental solution, Invisalign® is a tried-and-true teeth straightening method that’s been successfully used by four million people and counting. In Wayne, New Jersey, the Avant Garde Dental Arts team provides Invisalign to help you achieve your desired smile using a series of custom-made, near-invisible, thermoplastic aligner trays. Learn more about Invisalign and what it can do for you by calling or booking online to visit Avant Garde Dental Arts. Invisalign is a teeth-straightening treatment involving a series of custom-made aligner trays. Over time, the trays shift your teeth into place. The smooth, thermoplastic trays fit comfortably over your teeth and should be worn for at least 22 hours every day for best results. Every two weeks, you’ll return to the dental office for a new custom tray until you’ve reached your desired alignment. The process usually takes six to 18 months. Invisalign is a process designed to work over time. At your appointment, your Avant Garde Dental Arts dentist makes impressions of your teeth, digitizes them and creates a 3D model from the impressions right there in the office. Your dentist uses the 3D model to plan and fine-tune the shifting of your teeth and develop a personalized treatment plan. 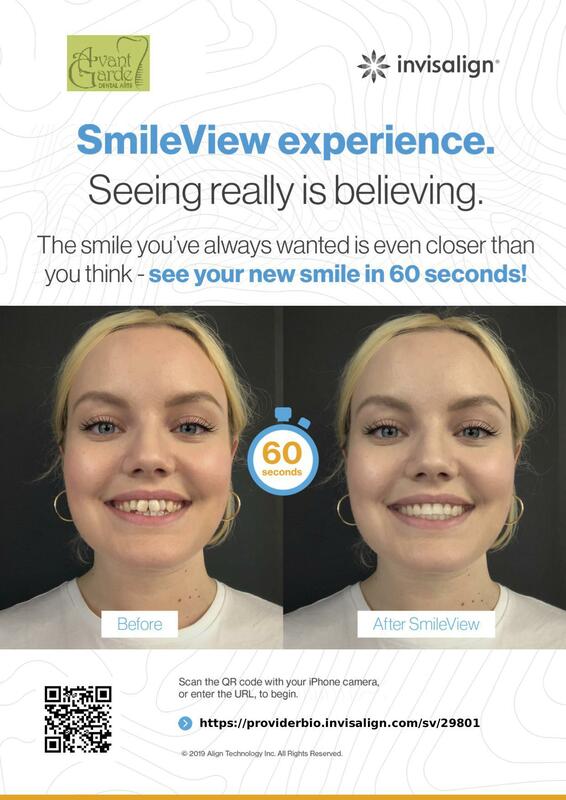 You can even preview your results and view a 3D computer simulation of how your straightened teeth will look. From this, your dentist can give you an idea of your estimated total treatment time. Your aligner trays are then created in a dental lab. Every two weeks, your replacement tray shifts your teeth more until you’re happy with the outcome and alignment. To care for your aligners, Dr. Gerskowitz recommends removing and rinsing them with warm water on a daily basis. You might also want to brush them with a soft toothbrush. After your Invisalign treatment, the Avant Garde dentists recommend wearing a retainer derived from the same material as the aligner trays to keep your teeth aligned and ensure they don’t drift out of place. Invisalign uses smooth, thermoplastic material that’s comfortable on your teeth and doesn’t irritate or poke your gums like traditional metal braces, which use tightening wires and brackets. The trays are discreet and removable, allowing you to easily brush your teeth or eat. Invisalign has had millions of happy customers and over 20 years of clinical research. Invisalign is effective for all ages, including adolescents and children. As an added bonus, there’s a compliance indicator that monitors the duration that adolescents are wearing their aligner trays. The Avant Garde Dental Arts dentists are happy to offer Invisalign to help get you closer to your desired smile — and hopefully get you to smile more. Call or schedule a consultation online.